God isn’t just “out there” somewhere. He’s right here, ready to protect and comfort, and every once in awhile He lets us catch a glimpse of what is just beyond our sight, as He briefly brushes the veil aside. Let me tell you why I believe this. Three days before our 18th wedding anniversary, Bob had an automobile accident that almost ended all future wedding anniversaries. We were living in Fort Wayne, Indiana at the time, where Bob was a pastor. A dinner was scheduled for pastors and their wives at my home church in Nappanee (about 60 miles away) on a Friday evening. Normally I would have gone with him, taking the chance to visit my parents while we were there; but I had been down with the flu that week, so I decided to stay home with our three children. Bob left home mid-afternoon and stopped and visited with my parents for a while at their home just north of Nappanee. About 5pm, Bob headed to the church, located several miles south of the small, rural town. While traveling through an intersection one mile south of town, a drunk driver sped through a stop sign at 80 mph and broadsided him. The full-size Buick hit Bob’s little VW Rabbit just two inches behind the doorframe on the driver’s side, continued through the intersection, and hit a telephone pole so hard the pole broke after being driven into the side of the car all the way to the radio. 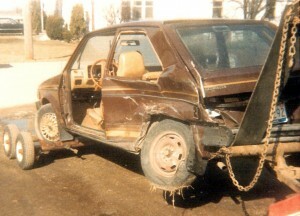 Bob’s car door immediately flew off, as his car spun around. The inertia threw him out of the car (with only his seatbelt restraining him) causing him to hit his head on the doorframe and knocking him unconscious. When the car stopped spinning, Bob was literally “sitting” outside of his car, with his seatbelt/shoulder harness still fastened. It had pulled so hard and fast as he was thrown out, that the fabric on his winter overcoat had melted where the strap had rubbed against it. But the seatbelt that had saved his life was now choking him to death. The shoulder strap was taut against his throat, strangling him, and he was starting to turn blue. The tough material of the seatbelt had to be cut to release the pressure it was putting on Bob’s throat, but with what? No houses were close-by and no one had anything to cut it. Then someone noticed that the driver from the car that hit Bob had a large hunting knife. They grabbed it to cut the strap and release Bob. A lady, who had stopped to help, knelt on the ground and held Bob from behind. She was prepared to support him as he was released from the shoulder strap. When the strap was cut, Bob started flaying his arms around – like you would if you were drowning and trying to come up for air. She told him, “Don’t move!” as she tried to support his neck and hold his arms still, not knowing what injuries he might have. The EMT’s arrived and were putting Bob on a stretcher when my dad arrived on the scene! He had been heading to the same church dinner as Bob was, when he came on the accident site. Dad saw Bob being loading into the ambulance, still unconscious and bleeding from the mouth and he didn’t know if his son-in-law was critically injured and perhaps even dead. Bob opened his eyes, saw my dad and said, “I really got my bell rung this time!” When Dad called and told me Bob had been in an accident, I didn’t know how serious he was hurt. But when I finally arrived at the hospital, I was told Bob didn’t have a single broken bone, had no internal injuries, or didn’t need a single stitch! Since he did have a slight concussion, they kept him overnight, but he was released from the hospital the next day. Now every March we celebrate two anniversaries: one for our wedding and one on March 18th when God sent his angels to protect Bob during and after the accident, but for even more. Bob doesn’t remember the accident; he even has a blank of time for several hours BEFORE the accident! He doesn’t remember talking to my dad, but when my dad needed reassurance that Bob was okay, he woke up, recognized him, and spoke to him. And better yet, the details I’ve shared of the accident were obtained from the lady who helped at the accident scene. We called to thank her and asked her to tell us everything that happened, which she shared in vivid detail. Then we asked her what hairstyle she had, because while in the hospital Bob had described a scene to me where a lady with brown hair, shoulder-length and cut straight across the back, was kneeling on the ground. She was trying to calm a man she was holding in her lap as he frantically waved his arms around. Bob never see her face, because he was watching the event from behind, standing at the back of his wrecked car! He said he wasn’t afraid and he didn’t have any regrets. He just had the most wonderful sense of peace he’d ever felt. When we told the lady this, she told us Bob was describing her in detail, but added emphatically, “He couldn’t have seen that, he was unconscious!” But that is the one thing he did see, not through human eyes or from a human perspective. The experience has given him a new insight on life and has taught us both about the thin veil that separates us from the other side. Sixteen years to the date (March 18, 2004) after Bob’s accident, I finally wrote the story down and sent it out in an e-mail to our family and friends. The next day my aunt died, so I returned alone to Nappanee for her funeral. Visitation at the funeral home was on March 21st, our 34th wedding anniversary. (It would be the first one we had ever spent apart). I arrived just before 2pm, hoping to be able to visit with the family throughout the afternoon when there were breaks in the attendance. But for the next 4½ hours, there were no breaks as a steady line of people paid their respects. The line wove back and forth inside, as people from the community waited to talk to the family. At one point, as I was standing in line, someone told me that the lady just ahead of me, standing with her back to me, was the lady who had helped Bob when he had his accident! I tapped her on the shoulder and when she turned around I said, “Hi, I’m Judy Douglas. I understand you helped my husband, Bob, sixteen years ago when he was in a car accident south of town.” She responded, “Oh, yes, I remember that!” I gave her a big hug and thanked her again for helping Bob. We never had the chance to meet her after the accident, so I was thrilled to finally be able to thank her in person. I told her I had something for her. Since my parents aren’t on the internet, I had printed one copy of the e-mail story of our two anniversaries (as printed above) and brought it with me to give to them. Instead, I gave it to her. One of my relatives introduced the lady to me, saying she was Holly (Hahn) Yoder. I briefly told them the story of Bob’s accident and how Holly had held Bob when they cut him loose from the shoulder strap that was choking him. Then I told them how Bob had watched the whole scene standing at the back of the car and his sense of complete peace, with no regrets and no fears, even in the face of death, and how heaven is very close to all of us. I got out a recent picture of Bob holding our granddaughter and showed it to Holly. She had never known him before the accident, and never saw him again after the accident, but she recognized him, even with his white hair and a beard, as she instantly replied, “Yep, that’s him!” We visited awhile and then I said, “God bless you.” She replied that He already had again and again. It was so awesome that I had come 1,000 miles to be with family and of ALL the people coming through the line that day, the lady who had helped Bob sixteen years earlier was there! The fact that I had been standing at just the right spot in line to meet her, that I happened to have a copy of the accident story to give her (on our wedding anniversary), and that I was finally able to thank her in person was unbelievable! That evening when I called Bob and told him what had happened, he was thrilled. It was like an anniversary gift to us. Later, I tried to remember who had pointed out Holly to me. Who would know her and could tell me that this lady, whom I’d never met, standing with her back to me, wearing a heavy winter coat, was the one who had helped Bob? (And the phrase I heard was, “That’s Holly, the lady who helped Bob at the accident.”) Who on earth would have known that she was the lady who had helped at the accident, would have known I was Bob’s wife, and would have been standing at just the right place, to tell me who this lady was? I just couldn’t think WHO it had been – I couldn’t get a picture of the person who told me to come to mind! No one around had an answer for me either. I am convinced God sent one of his messengers to stand in line that Sunday – someone who could make all the right connections – who didn’t have to see Holly’s face to recognize her, who knew me, who knew about the accident, and had us standing in line by the people who needed to hear about the peace we can have as we face death. Bob and I are both convinced it’s just one miracle upon another!